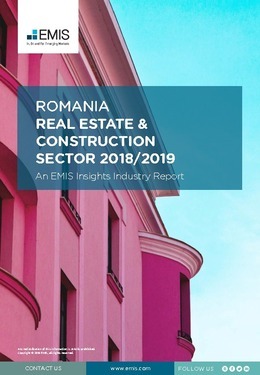 Following a two-year period of growth driven by the general economic expansion and the availability of EU funding, the construction market in Romania experienced a slight shrinkage in 2016, due to a combination of lower construction work volumes in some subsectors, lower investments and political tensions. The construction sector’s output in 2016 (defined in terms of total construction works performed under contract) was RON 67.6bn, down 11.4% y/y in nominal terms. The sector’s gross valueadded (GVA) formed 7.7% of the real GDP. The sector also employed 365,298 people. Construction was driven mainly by rapid developments in the real estate market that stimulated the growth of residential buildings’ construction. Rising income levels and an increase in employment are driving the demand for residential property, particularly among middle-income Romanians. The boom in services in Romania – particularly in the information and communications technology (ICT), business process outsourcing (BPO) and retail sectors – is boosting the demand for office space. This report provides a complete and detailed analysis of the construction and real estate sector for Romania. EMIS Insights presents in-depth business intelligence in a standard format across countries and regions, providing a balanced mix between analysis and data. Build a clear picture of production and completed constructions for sub-sectors (e.g. residential, non-residential and civil engineering) and the property market dynamics (e.g. vacancy rates, new leases and new projects).